[S182] Social Security Death Index (on-line), Ancestry.com, SSDI, Ancestry.com, SSAN 385-09-8937. [S602] Charles A. Rogers Jr., "Anthony Rogers," e-mail to James Hallowell Holcombe Jr., 4 July 2006 and following. [S603] W. D. Hamilton, Old North Esk. Joseph was a shoemaker. On September 1861, Joseph Warren roberts and his brother Chalres Watson roberts enlisted from Granville, Massachusetts in company F, 27th Massachusetts Volunteer Infantry. They wre mustered on 20 September 1861. At the time of their enlistment, Charles gave his age as 21 and Joseph as 27. Joseph evidently displayed natural leadership qualities; he was made a corporal at the time of hi senlistment, and on 1 January 1862 he was appointed sergeant. [S606] Richard C. Roberts, Roberts Reunion 4. [S137] Elisha Scott Loomis, Joseph Loomis, pages 140, 155. [S137] Elisha Scott Loomis, Joseph Loomis, page 155. [S137] Elisha Scott Loomis, Joseph Loomis, pages 155, 185. [S137] Elisha Scott Loomis, Joseph Loomis, page 185. [S137] Elisha Scott Loomis, Joseph Loomis, pages 185, 258. [S182] Social Security Death Index (on-line), Ancestry.com, SSDI, Ancestry.com, SSAN 266-76-2880. [S137] Elisha Scott Loomis, Joseph Loomis, page 258. [S606] Richard C. Roberts, Roberts Reunion 4, page 341. [S606] Richard C. Roberts, Roberts Reunion 4, page 248. [S606] Richard C. Roberts, Roberts Reunion 4, page 355. [S137] Elisha Scott Loomis, Joseph Loomis, page 184. [S137] Elisha Scott Loomis, Joseph Loomis, page 254. Hannah J. Stoddard was enumerated in the 1930 Gloucester, Essex Co., MA, federal census. She was a widow, age 71. Also in the household was daughter Lillian, 39. On 2 August 1862, Ham enlisted in Company E, Sixteenth Connecticut Regiment Infantry, the same unit his brother-in-law, John Obadiah Roberts, had joined the week before. At the time of his enlistment, Ham gave his place of residence as Hartland, Connecticut, his age as 28, and his occupation as farmer. Ham was mustered in on 24 August 1862. The new unit, without the benefit of drill or training, was immediately ordered south and soon met its biggest test. On 15 September, the federal army, led by General McClellan, outnumbered some 18,000 Confederalt soldiers on the high ground behind Antietam Creek by a margin of two to one. Yet through McClellan's ineffective military tactics, the fight which began on the Confederate left remained a stalemate as the two sides clashed in the woods, the cornfield, Bloody Lane, and Dunkard Church -- some of the bloodiest fighting of the entire Civil War. Shortly after noon, the left side of McClellan's line, including the 16th Connecticut, took up the battle with General Burnside in command. It ook nearly three long hours to cross Antietam Creek as Burnside attempted to get this men across a narrow structure that has gone down in history as "Burnside's Bridge." 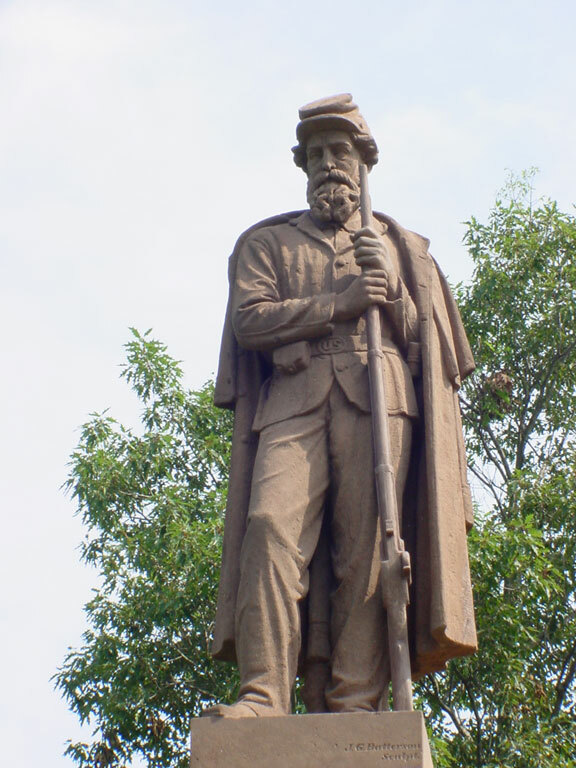 By mid afternoon, the 16th, presumably including Ham Allen Barnes and John Obediah Roberts, had reached the high ground overlooking Sharpsburg and had begun heading for the town itself. Defeat for Lee's Confederate army seemed imminent when suddenly reinforcements arrived from Harper's Ferry after a forced march, surprising the untrained Union troops. Ham Barnes was wounded in the ensuing fighting and was apparently taken to a temporary medical facility set up in a nearby barn. Finally, Burnside pulled his men back, and the battle ended in an apparent draw. Ham Barnes returned home to his family and was officially discharged for disability 26 October 1863. However, on 23 November 1863 the War Department created the Second Regiment, C.V. Heavy Artillery from what had been the 19th Connecticut Regiment Infantry and amended the recruitment qualifications. Ham met the new standards for Aritllery and volunteered to serve his country once again. On 5 January 1864, he enlisted and was mustered into the Second Regiment. [S606] Richard C. Roberts, Roberts Reunion 4, page 229. [S699] David Bridge, "Berthold Barruch Oppenheimer," e-mail to James H. Holcombe, 22 August 1947.